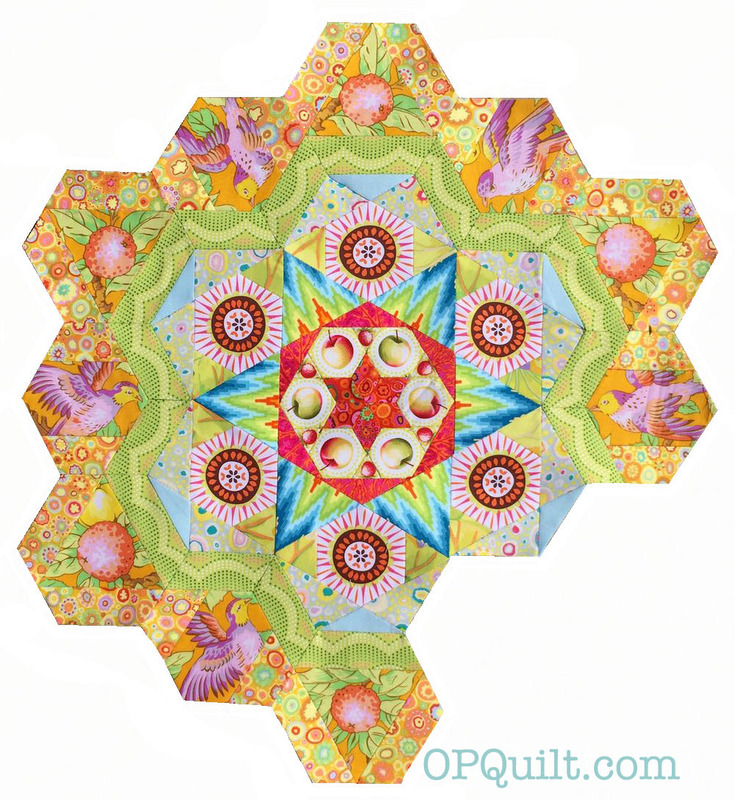 Rosette #6 for the New Hexagon Millifiore Quilt-A-Long | OccasionalPiece--Quilt! 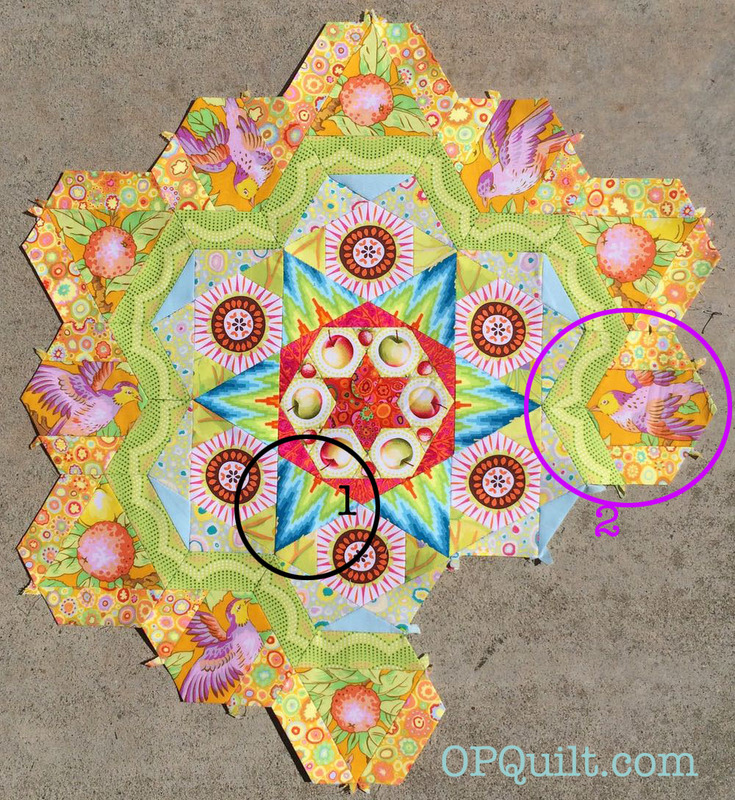 Posted on September 20, 2016 by Elizabeth E.
Here’s my rosette #6 for The New Hexagon Millifiore Quilt-Along. Why did I change it? I started looking at all the composite views of the rosette and just thought the star was too prominent, that it started a new conversation in the middle of the living room when the party around it was already having a nice chat, thank you very much. While I thought the original design was very clever, I needed it to change. In the black Circle #1, I created a new piece — that of two tall 30-60-90 triangles merged into one equilateral triangle. 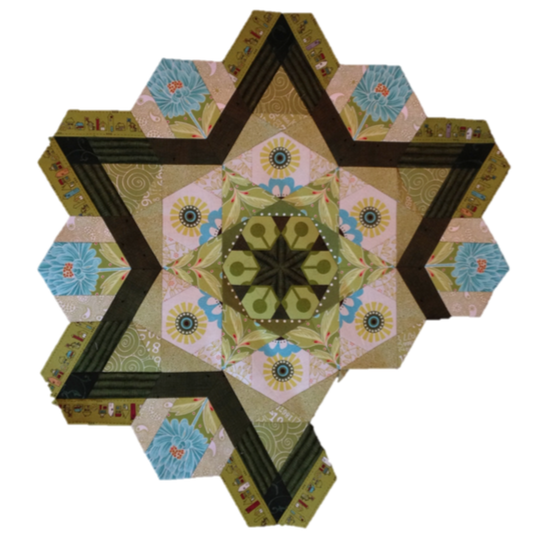 I studied my friend Laurel’s rosette (she is all finished with her quilt top) and noticed that in hers, as well as in many others, the right triangles of 30-60-90, when placed back to back with another, create a third pattern. It does the same thing in the original block, above. But I wanted to use this bargello/flame fabric and I only had a little bit, so that made my decision for me. In the dark pink Circle #2, I looked at other blocks that I’d sewn in my previous rosettes, because I wanted to nab their papers and re-use them. I found this shape in an earlier rosette, figured out that it would work, and am happy with the “ribbon” the multi-colored light-green fabric made. I had to sew on my equilateral triangles on the center section first, then the next inner row of partial hexies, in order to make it fit (the ones with the bold radiating circle design). Then it was add the last round, alternating the birds and the citrus fruit hexies. Here it is, laid out in Photoshop, which isn’t really the greatest approximation of how it looks in real life, but I’m not yet to the sewing-it-together phase. I’m still not 100% sure about the colors of Number Six, but I will try to bring in one more yellow spot somewhere — maybe in 10a — so I can balance those brights. I do not know about, nor choose the content, nor do I receive any money from these ads. I remain in total awe!!!!! I love them and you are putting lots of thought into how it all plays together. I understand your desire to get more parts together; that’s where I’m at with my LaPassacaglia. Thanks for sharing! Elizabeth, I love your new block. The colors are beautiful and uplifting and just sing. I so enjoy how detailed you are about your process and your choices. It is fascinating to follow and I always learn so much. Stunning! It is so much fun to read your analysis and thought process throughout the creation of this. I like you colour and design changes. I found the brown rosette very heavy and dark. Perhaps in your second colour choice the five pointed star would blend a bit more but love the time you spent to redo it. I love how the yellow recedes into the background, giving the blues a chance to shine on their own, especially with some more judiciously placed yellow. Your design changes were certainly justified in this layout. That light green ribbon caught my eye right away, it’s beautiful! All six of them together are really a knock out! If you add a bit more yellow elsewhere, it will all balance out, I am sure. As it is, the pink makes a nice focal point. So so beautiful! 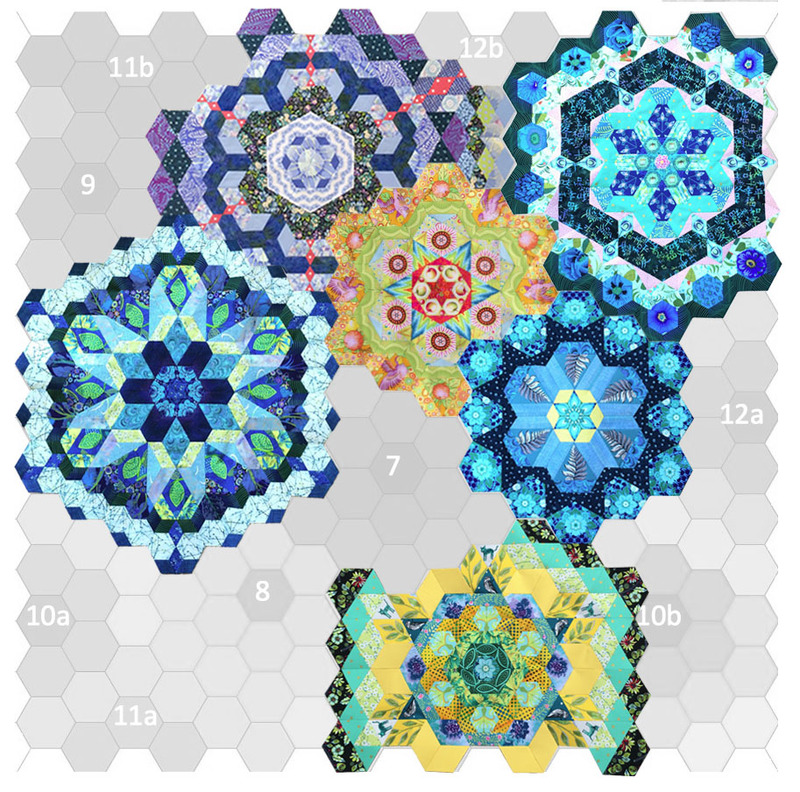 I really thought I’d have time in my little shop to play with hexies. Not! Very good design choice to make the change. Much much better. Love seeing all the other rosettes too. It’s going to be spectacular! !